Writing is 90 percent procrastination: reading magazines, eating cereal out of the box, watching infomercials. It’s a matter of doing everything you can to avoid writing, until it is about four in the morning and you reach the point where you have to write. NOW this I know! Very well. Remember when we tried to write that paper in college on the law of diminishing returns? Good times. Pinterest. Twitter. Facebook. Bejeweled Blitz. Candy Crush Saga. Cleaning out sock drawer. Cabinet under the sink, you’re next. Good thing I can cook! Something that smells insanely amazing. Heat oven to 400 degrees F. Lightly grease a 1-quart baking dish. Cut the feta cheese into 1-inch cubes. Set aside. Spread 1/2 cup of tomato sauce in the bottom of the baking dish. 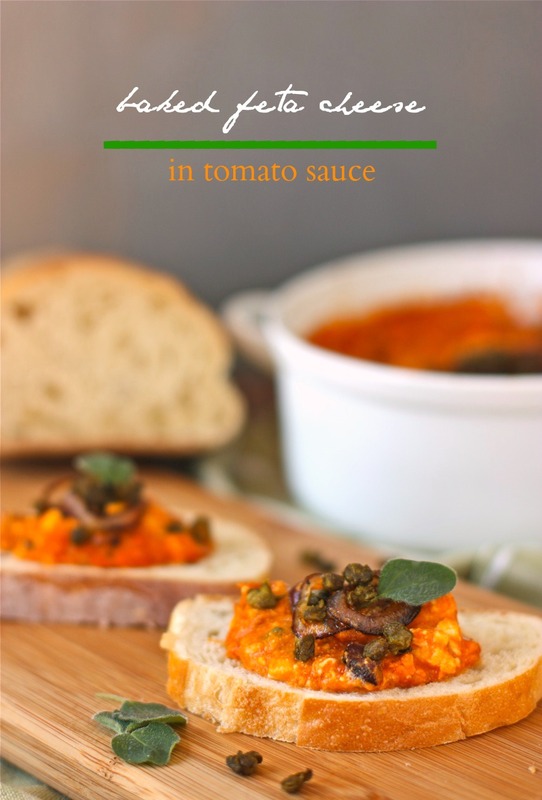 Arrange the feta, olives, and 1 tablespoon of capers evenly over the tomato sauce. Sprinkle the garlic, dried oregano, and red pepper flakes over the entire feta/sauce mixture. Season with freshly ground black pepper. Pour the remaining tomato sauce in the baking dish. If using, carefully crack the eggs over the top and season with some black pepper. Drizzle egg/tomato mixture with extra-virgin olive oil and parmesan cheese. Bake for 12-14 minutes, or until the cheese is soft and warm and the eggs are softly set. Stir the eggs into the warm feta and tomato mixture. While feta is baking, heat a tablespoon of olive oil in a non-stick sauté pan over medium-high heat. Add the capers and fry until golden and puffed up, about 2 minutes. Drain onto a paper towel. Fry the shallots until golden brown and drain onto the paper towel. Serve hot on slices of lightly toasted bread garnished with fried shallots, capers, and oregano leaves, or serve with pita or crackers as a dip. Adapted from Dare to Eat a Peach. Yum, this sounds divine! If I could eat this seven nights a week, I would. 🙂 Especially with the eggs in there! Now the next time I poach eggs in tomato sauce, I want to add feta cheese, too. Perhaps you had a bit of writer’s block but you sure had your photo mojo going. I’ve emailed this recipe to myself and cannot wait to try it. Thanks! Daisy, this looks sooooo good! Might have to do this in individual ramekins for brunch! That’s a great idea making this in individual ramekins. You just gave me the idea to use my cute little cast iron pans the next time I make this. How well I know it. How much of the brief do you have done, Michelle? Oh, just the first paragraph. Beautiful dish though! Mmmmm… that is what I said when I saw this. And then I said.. I need to organize myself enough to make this. Yes to so many sources of brine and salt on one piece of toast! I’m going to dress mine up this way next time. 🙂 And oh, how I wish I organized my sock drawer during bouts of procrastination. I’m much less productive! Well, you may be feeling writer’s block, but you’ve still written a lovely post! I love the tweaks you made to the recipe. Note to self: fry capers next time. I only like olives and capers when they’re cooked. I love fried capers since they become crispy and their saltiness is accentuated. We finished the batch I made last night. I’m making another batch later this afternoon. Your recipe is a runaway hit at our house! Oh Daisy, I can so relate. To all of this. There is nothing, NOTHING so frustrating as writer’s block. (Okay, maybe a few things. BUT.) Great post, and what great quotes you found! The dish reminds me quite a bit of shakshuka, which is one of my very favorite things to eat. Lovely. Almost what we call in Greece ‘mpougiournti’ nice alternative! That looks wonderful, Daisy – never seen anything like this actually. Sounds delicious.